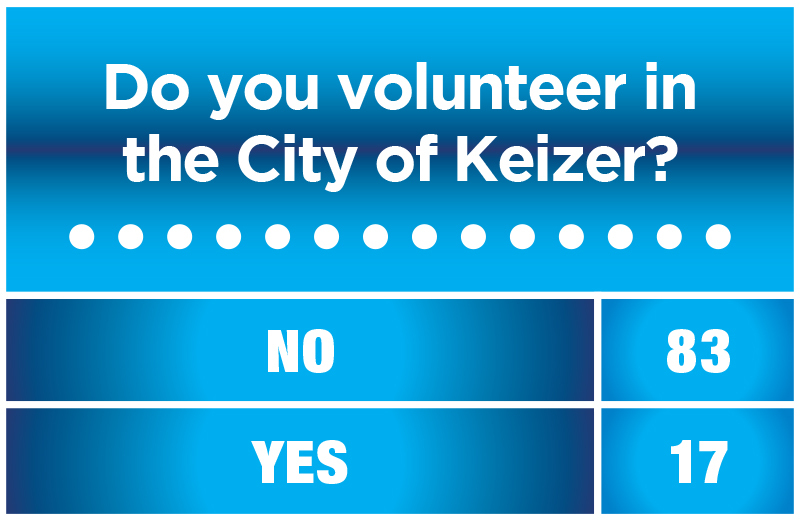 Keizerites gave mostly glowing marks to the way the city of Keizer is run, but volunteerism – a staple of “The Keizer Way” – appears to be on the way out of vogue. The city recently completed an online survey of residents with about 800 respondents. The results from the multiple choice segments of the survey are now available at www.keizer.org. For the most part (61 percent), responders felt they were getting their money’s worth for local taxes. About 22 percent said they didn’t know and 16 percent felt they weren’t. If given the chance to dole out the city budget themselves, respondents heavily favored public safety. Given a $100 pot to draw from, residents allocated $64 to public safety, $21 to administration, $8 for community development, $5 for parks and $2 for a contingency fund. Responders (55 percent) also wanted to see the Urban Growth Boundary (UGB) of the city expand slightly. Only 6 percent wanted to see aggressive expansion of the UGB, while a little less than 40 percent thought Keizer was big enough already. Expansion of the UGB would require knocking down a lot of bureaucratic and zoning barriers. Keizer shares the UGB with Salem and is required to have capacity that will last for 20 years. The capacity is already there, but it’s all in south Salem. When asked about their impressions of public safety-related issues, residents were overwhelmingly (94 percent) found to have confidence in Keizer police officers. About the same percentage felt safe in Keizer and in their own neighborhoods, but it also depended on the time of day. When asked whether they felt safe walking down their street during the day, nearly 65 percent strongly agreed with the statement. After nightfall, the percentage that strongly agreed dropped to 27 percent. That may seem like a steep decline, but it’s an improvement overall from the last time the survey was conducted in 2013-14. At that time, only 55 percent of respondents strongly agreed to feeling safe walking down their street during the day; only 20 percent of the responders strongly agreed with the statement about walking their street at night. About 84 percent of responders felt that traffic is a problem in Keizer, but only 70 percent attributed those problems to traffic violations. Regarding police time spent enforcing traffic laws, almost 60 percent said KPD was in line with their expectations, about 34 percent wanted more traffic enforcement and 7 percent wanted less traffic enforcement. The survey also found that there’s less investment in the city’s motto of Pride, Spirit and Volunteerism. Only 17 percent of responders said they volunteered in Keizer, 83 percent said they didn’t. While the survey did not ask about volunteering in other areas, fewer people (41 of 827 responders) skipped the question than any other in the survey. The volunteering numbers were 22 percent and 78 percent, respectively, in 2013-14.